Distribution. Radish root maggot is a native species, and western in distribution. It is known from Alaska and Manitoba in the north, with its range extending south to California and New Mexico. Host Plants. This insect principally attacks plants in the family Cruciferae. Vegetable crops suitable for survival of radish root maggot include Brussels sprouts, cabbage, cauliflower, Chinese cabbage, rad ish, and turnip. Occasionally it has been observed to develop in the pods of pea and lupine. Weed hosts include pepperweed, Lepidium densiflorum; and tansy mustard, Descurainia pinnata. However, radish is the principal host, and is the only plant known to be damaged seriously. Natural Enemies. The natural enemies associated with cabbage maggot, Delia radicum, and other Delia spp., are likely the principal predators and parasitoids of radish root maggot. The parasitoids Trybliographa rapae (Westwood) (Hymenoptera: Eucoilidae) and Aleochara bilineata Gyllenhall (Coleoptera: Staphylini-dae) are known to parasitize up to 20% of the maggot population, with the staphylinid being considerably more important (Wishart, 1957; Kelleher, 1958). Ground beetles (Coleoptera: Carabidae) are considered as important egg predators, but no data are available to be document their effects. 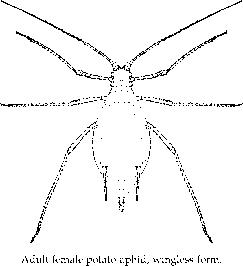 Hyslop (1912) reported rearing parasitoids from this fly, but he did not give any indication of their importance. Life Cycle and Description. In Manitoba, about three generations develop annually. Overwintering occurs in the puparium. Adults from overwintered pupae appear in late May to early June. This is followed by the first generation adults in late June and early July, second generation adults in early August, and the offspring of the second generation overwintering. The life cycle is not well studied. Oviposition occurs over a 10-20-day period, producing only 40-50 eggs during their life span of about 30 days. Eggs are deposited in clusters of 1-3 on an exposed portion of the root, or on the inner surface of a leaf petiole. Thus, they differ from most other Delia pests, which tend to lay larger clusters on or below the soil surface. Duration of the egg stage is about two days. The whitish larvae feed within the root and attain a length of about 7.9 mm. They possess a typical maggot form, generally cylindrical in shape but tapering from the bluntly rounded posterior end to the pointed anterior end. Duration of the three instars is about 3, 3.5, and 10 days, respectively. Pupation generally occurs in the soil near the host plant. The puparium is brown to brownish-black, and measures about 6.4 mm long. The adults are very similar to seedcorn maggot flies, Delia platura (Meigen), in general appearance. 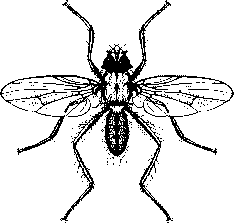 The flies are gray or yellowish-gray in overall body color, but marked with a black dorsal stripe on the abdomen. The thorax bears a medial and two lateral stripes, but they are weak. The wings are not marked. Males measure about 5 mm long, and females 6 mm. The only significant treatment of radish root maggot biology was provided by Kelleher (1958). Hyslop (1912) gave a description of the developmental stages. Brooks (1951) provided some valuable observations and a key to differentiate radish root maggot from similar crucifer-infesting flies. In a study of radish-infesting flies conducted in Manitoba, Kelleher (1958) found radish root maggot to be the dominant pest species. There usually are few larvae per radish, often only one, so plants are not heavily damaged and do not exhibit obvious symptoms of attack. Although damage is not evident until the radishes are harvested, even one insect can destroy the commercial value of a radish. Because the insects feed internally and are difficult to detect, even a low incidence of infection may destroy the commercial value of a crop. Management practices developed for cabbage maggot, Delia radicum (Linnaeus), and seedcorn maggot, Delia platura (Meigen), are applicable to radish maggot. Prevention of damage is normally accomplished by application of liquid or granular insecticide to the soil at planting.